The system is fairly easy to install as most of it is pre-plumbed. 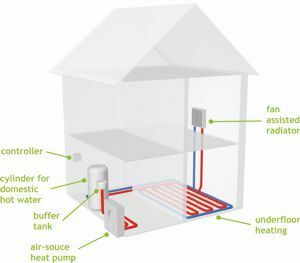 The Samsung air source heat pump itself is located externally, near a wall of the property that it will be serving and uses the heat from ambient air, which is a free and renewable energy source for heating and domestic hot water. 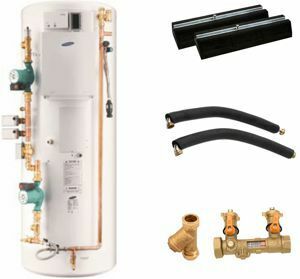 The unit is connected to a pre-plumbed cylinder with a built-in buffer tank, to serve your heating and domestic hot water. The cylinder will normally be located on the ground floor. A buffer tank is generally thought of as a useful addition to any system as literally a ‘buffer‘ to the air-source heat pump having to go on and off all the time, just for one particularly cold room in the home that calls for heat more than the rest of the house. The buffer tank is therefore used for short requirements of heat for the house and on the defrost cycle used by the air source heat pump. The pre-plumbed tank, which holds all the domestic hot water, is supplied with the buffer tank integrally and there is also an option for the tank to include a secondary coil to receive heat from an external heat source such as solar panels. The Fill & Flush Point allows your plumber to fit a flush machine to the system without breaking the pipe, to purge the system of air, or for a routine glycol change every five years. We would recommend that the air source heat pump be located within 15m of where the water cylinder was to be located within the home. We leave installation to your on-site plumber so that one person has complete control of the plumbing services of your whole home. It would also probably be a lot more economical to use your on-site plumber too. If you are hoping to get money back with the RHI (Renewable Heat Incentive) from Ofgem, you would not only need to get an EPC (Energy Performance Certificate) completed, but you would need to get the air source heat pump MCS (Microgeneration Certified Scheme) certified. Samsung EHS system has a three year manufacturer‘s warranty on parts, plus a warranty labour allowance, where you would contribute to the installers labour to change the faulty part. However, if the system is MCS installed this warranty will be increased to five years. The warranty agreements are supplied on the understanding that the installation is completed as per the manufacturer‘s instructions and with regard to any MCS recommendation or procedure(s). It is also a requirement that anyone working on the Refrigerant side of the Samsung Heat Pump should be City & Guilds 2079 Refrigerant Handling qualified (or equivalent). 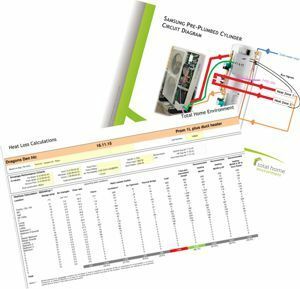 Please note that we would recommend a detailed room-by-room heat loss calculation to ensure that you get exactly what is required for your heating and hot water solutions. Getting this specific, ensures that you identify where a room, despite having the same construction as the rest of the house, gets a lot colder or hotter than the rest of the house and this therefore ensures you can design the system accordingly. For instance, a north facing room with three external walls will be a lot colder than a south facing one with only two.